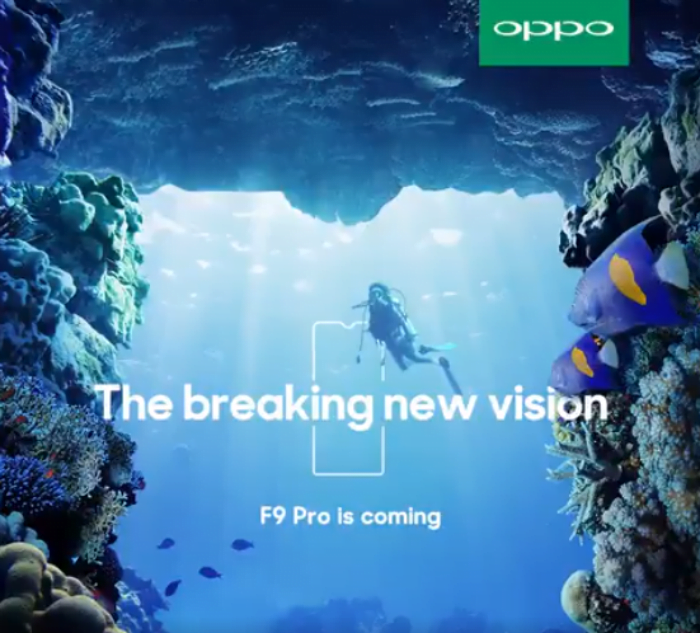 Oppo has started teasing a new smartphone launch in India and the device in question is the Oppo F9 Pro, which recently received Bluetooth certification alongside the standard Oppo F9. Oppo Mobile India has posted a teaser video on Twitter stating ‘The Breaking New Vision,’ along with the device on the back side showcasing the front part. The Oppo F9 Pro will have an Essential Phone-like notch on top of the display, which is the reason behind the new vision taglines from the company. The screen aspect ratio on the Essential Phone was 19:10 and the Oppo F9 Pro is expected to have the same aspect ratio. The Oppo F9 Pro will succeed the Oppo F7 in India. It was just four months since Oppo launched the F7 in the Indian market and we’re already having a successor to the smartphone. The Oppo F7 was one of the first smartphones to debut with a notch in India. The F9 Pro will have a smaller notch just for the front-facing camera, same as the Essential Phone. Oppo is trying out all the technologies in the market in recent times. It was the first to jump in and launch a smartphone with an Apple iPhone X-like notch; Then it launched a fully bezel-less smartphone dubbed as Oppo Find X with a motorised camera, and now, it’s launching a smartphone with a notch housing just the front-facing camera. That being said, we don’t have the specifications of the Oppo F9 Pro just yet. Interestingly, the Oppo F9 Pro received Bluetooth certification alongside the Oppo F9, but it’s unknown at the moment whether Oppo will launch the standard F9 in India or not. The F9 Pro, on the other hand, is expected to be powered by the same MediaTek Helio P60 chipset as the Oppo F7. It’s also expected to come with the same 25MP front-facing camera module, but on the rear side, this time around, there will be dual camera setup. The Oppo F9 and F9 Pro were recently spotted on TENAA website, which revealed the design of the handset. Besides these details, we don’t have much information about the Oppo F9 Pro. Oppo, Vivo are polar opposites of Oneplus. No custom rom support whatsoever.